I love one-skillet meals particularly for during the week meals. 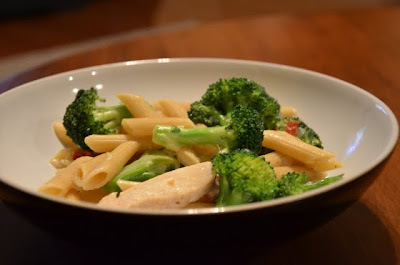 This meals satisfies my quickly bored taste buds by giving me pasta, chicken, broccoli, and sun-dried tomatoes flavored with my favorite product, cheese, all in one dish. There’s something to be said about having multiple things to eat which is why I was mildly obsessed with a lunch place in Columbus where you got mini-sizes of THREE items for lunch. You could never get bored with what you were eating! Although you can’t really tell in the photo, there is a little bit of sauce to the dish too to keep it flavorful. Please note though that you need a skillet WITH a lid. Season the chicken with salt and pepper. Heat 2 tablespoons of the oil in a 12-inch or slightly larger non-stick skillet (one that you have a lid for!) over medium-high heat until just smoking. Add the chicken in a single layer and cook for 1 minute without stirring. Stir the chicken and continue to cook until most, but not all, of the pink color has disappeared and the chicken is lightly browned around the edges, 1 to 2 minutes longer. Transfer the chicken to a clean bowl and set aside. Add the remaining tablespoon of oil, onion, and 1/2 teaspoon salt to the skillet. Return the skillet to medium-high heat and cook, stirring often, until the onion is softened, 2 to 5 minutes. Stir in the garlic, oregano, and pepper flakes, and cook until fragrant, about 30 seconds. Add the pasta, 3 cups of the water, and the broth. Bring to a boil over high heat and cook until the liquid is very thick and syrupy and almost completely absorbed, 12 to 15 minutes, stirring occasionally. Add the broccoli, sun-dried tomatoes, and the remaining 1 1/4 cups water. Cover, reduce the heat to medium, and cook until the broccoli turns bright green and is almost tender, about 2 minutes. Uncover and return the heat to medium-high. Stir in the cream, parmesan, and reserved chicken with any accumulated juices and continue to simmer, uncovered, until the sauce is thickened and the chicken is cooked and heated through, 1 to 2 minutes. Off the heat, stir in the lemon juice and season with salt and pepper to taste. Serve, passing more grated parmesan at the table, if desired.